#10 in my challenge is a scene from Chagrin Falls, OH – what attracted me about the scene was the stack of rocks highlighted by the beautiful waterfalls. 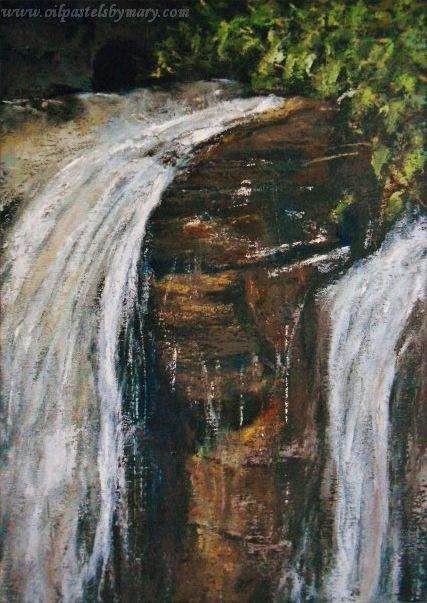 Chagrin Falls, an oil pastel (7×5) was painted on black Mi-Teintes Pastel Paper – the paper was perfect for creating a dark atmosphere as the base of the scene, letting the stack rocks standout and the waterfall punctuate the senses. Mainly used Senneliers brand of OPs, as well as Neopastels and Holbeins. The reference image is from Michele Long of pmp. This entry was posted in Challenges: Subject Matter Studies, OPs New Paintings, Rocks/Boulders and tagged oil pastels, painting, rocks, waterfall. Bookmark the permalink. Love the spray of water you were able to capture! Wonderful, Mary. I love the golden tones in the front rocks. Thanks Kerry ~ have a great week. Wonderful energy in this study! Love the flowing water across the face of the rocks and the bit of green frames the entire piece very nicely. I’d say you nailed your rock challenge! Thanks Rhonda! It was a fun scene to develop, the water added a lot of interest – have a nice weekend. Great movement and as always I love your color usage. I am intrigued by these challenges you set for yourself. Your creativity and work seem boundless. Ha Frank, wait til you see the next location – clear across the world! Thanks for checking in and your comment!! Well done at increasing my anticipation. Love the name of the falls, a French name as well, and your personal portrait of the waterfalls too, of course. What a dramatic scene! Love how the waterfall frames in the rocks which are solid and stable compared to the fluidity and transparency of the water, love the balance.The two compliment each other in the best possible way! Superbly executed study! Thank you Eva – great and assessment, your description nails the effect of what I wanted to achieve when I first set out to paint this scene. These rock studies have been a good challenge for me. Have a wonderful weekend! here is a strong capture of movement and energy. Yes! Hi John, thanks very much! I agree about those shiny drips between the two rushing streams, especially beautiful….but the whole thing is lovely. I like how you’re trying all different kinds of stone, with their different hues. And the name “chagrin” falls sent me to googling to find out how it came about…. Hi Cynthia, so glad that you enjoyed the piece – the water was fun to develop. Pretty interesting little place, right? I have some more rocks that are really meant to give me a challenge, and they will for sure. It may be easier to paint rocks if the surface was larger, but these small pieces force me to focus and think about the subject more fully. Mary, this one is just lovely. You have really captured the sense of the water flowing over the rock. Great color contrasts, too. Hi Janell! Thank you so glad you could feel the water movement – that’s one of the aspects I was attempting to capture in this piece! I love this, Mary! The color of the rocks, the green in the back and the way you captured the fall of the water. Superb! The composition is just perfect! Hi Francesca, thank you very much so glad you liked the colors in this piece – they were especially fun developing them and the texture of the rocks and water. Nice how you captured even those smaller streams of water on the corner of the rocks. For whatever reason, this work makes me feel hopeful and peaceful. Hi A! Thank you for the compliment and today we all need a little peace – hope that this scene brings a sliver of it to everyone looking at it.